DALLAS – Military shoppers hunting for the hottest toys of the season will find holly jolly savings in-store and online with the Army & Air Force Exchange Service’s Toy Book, filled with gifts ideas for kids of all ages. The 24-page shopping guide, available Oct. 17 in the continental United States and Oct. 29 overseas, is packed with Military Brat-Approved toys, including Lalaloopsy dolls, Kidzoom Smart Watches and Teenage Mutant Ninja Turtles action figures. 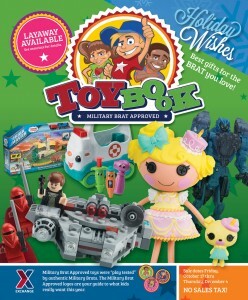 Shoppers will find the Military Brat-Approved seal of approval throughout the shopping guide highlighting the hottest kid-tested toys. For those who want to shop online, the Exchange’s site, shopmyexchange.com, is brimming with this season’s best toys, too. Online purchases ship for free when shoppers use their MILITARY STAR® card. The Toy Book is available at Exchange locations worldwide. To find the nearest Exchange, shoppers can visit www.shopmyexchange.com/exchange-stores. This entry was posted on Tuesday, October 14th, 2014 at 10:04	and is filed under Press Release. You can follow any responses to this entry through the RSS 2.0 feed.